Kedgeree is one of my all-time favourite meals. While the British consider kedgeree a breakfast dish, we usually eat this delicious concoction of smoked fish, rice, eggs and curry as a weekday supper with a good dollop of mango chutney. The version I make is the dry kedgeree in Simon Hopkinson’s The Prawn Cocktail Years. This wonderful cookbook rehabilitates classic, once-loved recipes that have fallen out of favour. In an oven-proof pot with a lid (I use my Le Creuset casserole), melt the 50g butter over a medium-low flame. Add the curry powder and allow it to sizzle for thirty seconds before adding the rice and corn. Fry for a couple of minutes, stirring to coat. Add the stock, saffron and bay leaves and bring to a simmer. Slide the smoked haddock into the pan, and bury it under the rice. Cover the pot and transfer to the oven to cook for twenty minutes. When the time is up, remove the pot from the oven but don’t remove the lid for another ten minutes, as the rice is continuing to cook. While the kedgeree is in the oven, heat a small frying pan over a low flame and melt the remaining 15g of butter. Whisk together the eggs, chillies and salt, then pour the mixture into the frying pan. Allow it to set, then flip the egg over and cook the other side briefly. Slide the omelette onto a chopping board. Cool for a few minutes then slice it into thin ribbons. 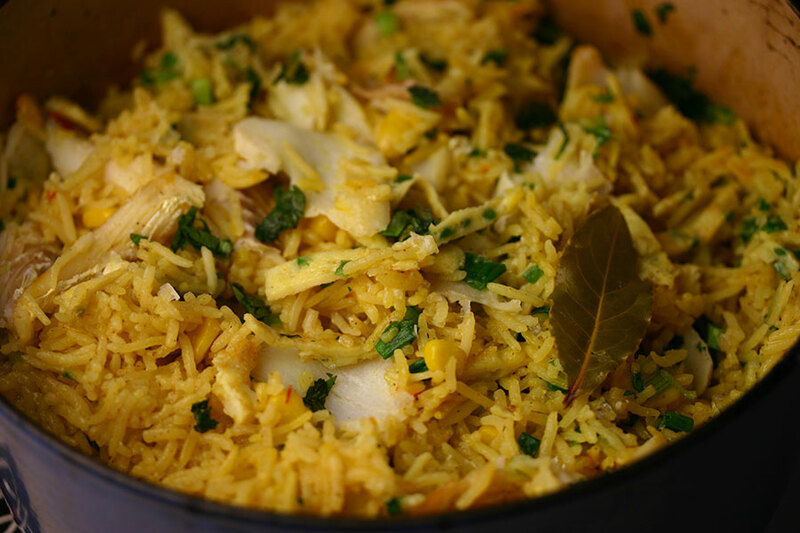 When the kedgeree has finished resting, remove the lid and flake the fish through the rice using two forks. Stir through the omelette slices, green onions and coriander. Serve with a wedge of lemon and a spoonful of mango chutney. I recall us ‘comparing’ our versions of Kedgeree some years ago. They were very similar but with a couple of key differences. Despite being a firm believer in using boiled eggs I must confess I have on occasion made it using your omelette method and it has been fab!! Hope you have settled back into London life. My Aunt Bridie used to make Kedgeree for my mother. We weren’t too keen as kids. There was a very soiled handwritten recipe for Kedgeree taped on an inside cupboard door in her apartment…it said “My mother-in-law’s Kedgeree”.